Excerpt from U.S. Coast Guard “Proceedings of the Marine Safety & Security Council” magazine by SGT Ryan Matson, U.S. Army 372nd Mobile Public Affairs Detachment. In April of 2008, Coast Guard seamen from several Caribbean nations engaged in a law enforcement training exercise in which they tracked down and apprehended a suspected terrorist. This exercise was just one training scenario in “Operation Tradewinds,” a two-week training exercise in the Dominican Republic. During this exercise, U.S. Army, Navy, Coast Guard, and Marine personnel and soldiers, seamen, and police officers from partner nations in the Caribbean trained on everything from martial arts to basic urban skills. 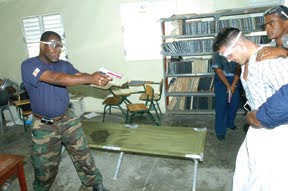 The picture shows Leading Seaman Brangurgon Glasgow of the Saint Vincent Coast Guard and Dominican Republic Coast Guard Ensign Manuel Fernandez acting out taking a terrorism suspect portrayed by a U.S. Coast Guardsman into custody. During the law enforcement training, a group of partner nation seamen simulated boarding a cruise ship vessel after a person of interest arrived at their port. Next they searched the quarters of the suspected terrorist, where a variety of clues and pieces of evidence could be found—everything from bombs to maps of the vessel, and, perhaps most importantly, the suspect’s passport. The passport was of particular significance because the seamen did not have any photo identification of the suspect in the exercise. After the partner nation seamen were done searching the quarters, their U.S. instructors showed them where some of the clues they missed were hidden. Evidence was hidden everywhere, from cracks in the wall to under boards and mattresses. This evidence gave the seamen enough proof to detain the suspect—the second portion of the exercise. In the next scenario, the partner nation seamen approached the subject in a lounge and attempted to take him into custody. A different situation unfolded for each group that made this attempt. In one case, the bartender in the lounge whipped out a pistol and acted as a second terrorist. In another training session, another role player burst through a back door and ambushed the seamen. (In all cases, role players used air pistols that fired soft pellets.) The seamen said they learned a lot from the “surprise” portion of this exercise. After apprehension, the participants searched the suspect, recovering a knife and more information relating to the overall “plot.” Through every stage of the process, the seamen kept in close contact with their command, radioing in their actions and receiving guidance on the mission. The law enforcement exercise served as something of a final exam for the participating seamen. This portion was emphasized with good reason, since participants will more than likely be involved with similar situations in real life. Full article and “Interagency Success Stories” edition of USCG Proceedings is available at http://www.uscg.mil/proceedings/spring2009.